These stories are from Marfa Public Radio’s “Love On The Range” event at the Marfa USO Building on February 28, 2019. The storytellers for the evening were David Williams, Eve Trook, Michael Stevens, Suzanne Dungan, and Allison Scott. This program was made possible by Localore Live. Thanks to the Association of Independents in Radio for their support. 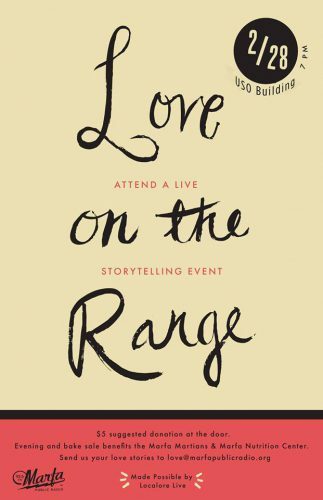 This entry was posted in KRTS News and tagged live storytelling, love on the range. Bookmark the permalink.